It’s important to setup Google AdWords Conversion Tracking to be able to see how your ads, keywords, ad groups and campaigns are performing. Without tracking, you’ll struggle to optimise your campaigns effectively. The steps to setup conversion tracking are easy to follow and within a few minutes you can have it completed. First make sure AdWords and analytics are linked. Because you will create the goals in analytics and then they’ll be imported into your AdWords account, it will be important to do this step first. 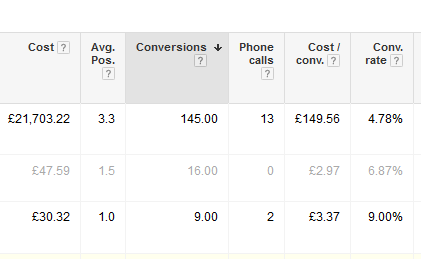 Now you can import the goals into AdWords and setup conversion tracking. Go to the tools section in AdWords and then click on Google Analytics. You’ll see the goals that are available to import. Select them one by one or all at the same time and then click import. It would probably be best to select them one at a time especially if they are different conversion types. ⁃ Category – what category does the goal fall under? Is it a purchase, a signup, a lead or just a view of a page. And this is why it’s important to import the goals one at a time if they fall under different categories. ⁃ Value – next decide what the value of each conversion is to you. If you’ve set a value in google analytics you can choose to manage this over there and just import it too. ⁃ Conversion window – chose how long after a Click you’d like to track conversions. The default setting is 30 days but you can change this to whatever you like based on your knowledge of your industry. ⁃ Attribution model – this is a feature for Search and shopping conversions and helps you choose how much credit each click gets for your conversions. The default attribution model is ‘last click’ but that may not be ideal for your business. Use the attribution modelling tool to compare different models side-by-side.